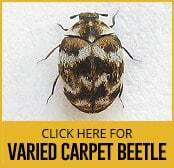 Is your home being eaten alive by the larvae of textile pests such as the Leather Beetle, the Fur Beetle or the Varied Carpet Beetle? If so you need to take swift action to eradicate this nuisance before your carpets and clothes become piles of dust. 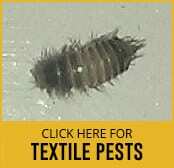 Why Do Textile Pests Want to Live in Your Home or Workplace? The larvae of these little beetles love to eat away at the natural fibres in your home, searching out their favourite protein, Keratin, inside your lovely wool carpets, and deep inside your sofa upholstery. Any animal fibre is at risk: hair, silk, fur and feathers. This is very similar to the damage done by moths. These beetles like a bit of culture too. A delicacy of these pests are the soft pads and felts found on woodwind instruments and their cases. They also like a trip to the museum to feed on any exhibits containing dead insect specimens. Have you seen any of these culprits in your home or workplace? The Leather Beetle is dusty black with some white on its underside, and about 8mm long. The Fur Beetle, about 5mm long, dark with two white dots on top. The Varied Carpet Beetle, 3mm long, with a patchy pattern of different colours; often a white, black and yellow mixture. These beetles may feed outside the home, but then fly or crawl in from the garden to lay their babies in your comfy wardrobe next to your best suit or dress. The eggs hatch out into larvae. The larvae then seek out your clothes or duvet, or even your favourite armchair and start munching away. The larvae look like little maggots or caterpillars. Faecal pellets are a sign that these beetles are at work in the area. How Do You Remove This Pest? Regular vacuuming of all those dark undisturbed corners will only remove some of the beetles and larvae. DIY treatments will not go deep enough to prevent the damage done by this pest. A professional treatment will avoid harsh chemicals that could damage your delicate and valuable possessions. Our experts will be able to identify clearly which textile pest is at work and the exact treatment needed to make a thorough removal of the problem. If any of these textile pests are laying their darling little eggs in your home it is important that you get a professional deep and long-term treatment that removes the problem at each stage of the beetles life cycle.